When me and Sarani of Cocoawind started our Ingredient of the Month - Kickass Quinoa series, little did I know that my entire perspective towards this super-grain is going to change. Earlier for me, Quinoa was just a Low-Carb alternative to Rice. But it is so much more now. My go-to binding agent for my Burgers and Patties. A protein and fiber boost for my muffins, snacks and other indulgent delights. And now I have even incorporated Quinoa in desserts, making them indulgent and nutritious - all at the same time. Where were you all my life! Toasted Quinoa - It's revolutionary! Toasty, crunchy, nutty and oh-so-aromatic! 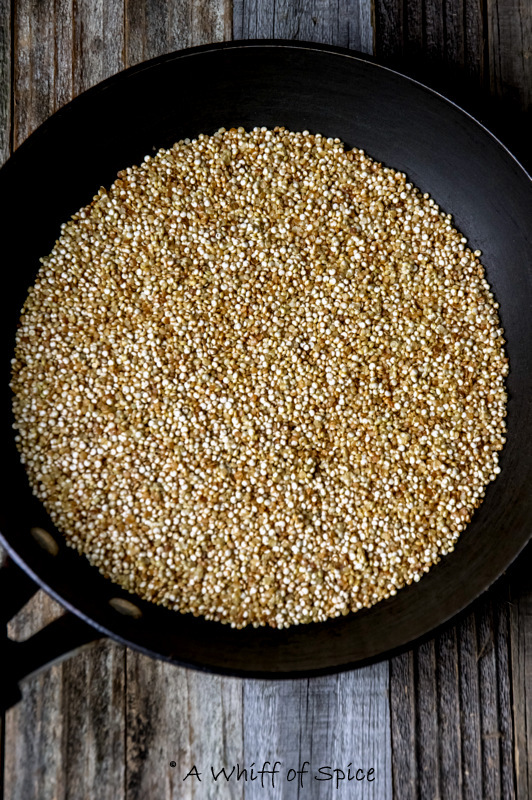 Once you try it, you will never be able to look at Quinoa the same way again. The idea of toasting the Quinoa till its golden and crunchy came during a discussion at Sarani's FB page. Kankana Saxena, dry roasts her Quinoa till crunchy and tops her soups with that. I thought it was plain genius. It would be an awesome substitute to croutons in a salad too. 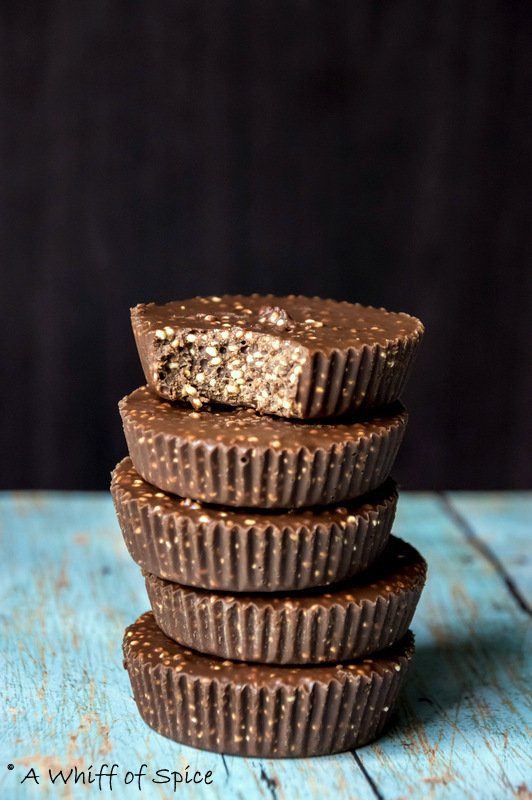 In this recipe, I combined the nutty crunch of Toasted Quinoa with my favorite combination of Peanut Butter and Chocolate. I used Dark Chocolate and sweetened it with a touch of Honey. You can substitute the Honey for Agave or Maple Syrup. Or just skip any form of sweetener and use Milk Chocolate instead. But then again, you'll be depriving yourself the amazing health benefits of Dark Chocolate. Sid thought it tasted like a crunchy Reese's Peanut Butter Cups. I would say, it was pretty darn close. I made them in standard muffin tin using paper liners. I think using a mini muffin tin should have been a wiser choice. Just an afterthought! Or you can simply set in a 9x9 inch square pan and then cut it into 'bars' or 'squares' instead. Have it any which ways, its plain delicious! Dark Chocolate with Pomegranate Squares a.k.a. Antioxidant Squares! Chocomole - A Sinful Chocolate Pudding that's Actually Good for You! 1. Line a 12 cup muffin tin with paper liners. 2. Give the raw, uncooked quinoa a good rinse. Easiest way is to take the quinoa in a fine mesh strainer and running water through it while scrubbing well for couple of minutes. This gets rid of 'saponin' which coats the seed and is responsible for the bitter and soapy after taste of quinoa. 3. Heat a large pan or a wok on high heat. Add the rinsed Quinoa. Bring down heat to low and toast the Quinoa till all the moisture is evaporated and the grains are slightly golden, crunchy and you kitchen is filled with nutty, toasted fragrance. It takes about 15 to 20 minutes on low heat to get it evenly toasted. Keep aside to cool it down a bit. 4. While the Toasted Quinoa cools, in a small saucepan, combine the peanut butter, chopped dark chocolate, honey and the coconut oil and a fat pinch of Sea Salt, over low heat. Mix till everything is melted in a smooth and silky, homogeneous puddle. 5. Fold in the Toasted Quinoa. 6. 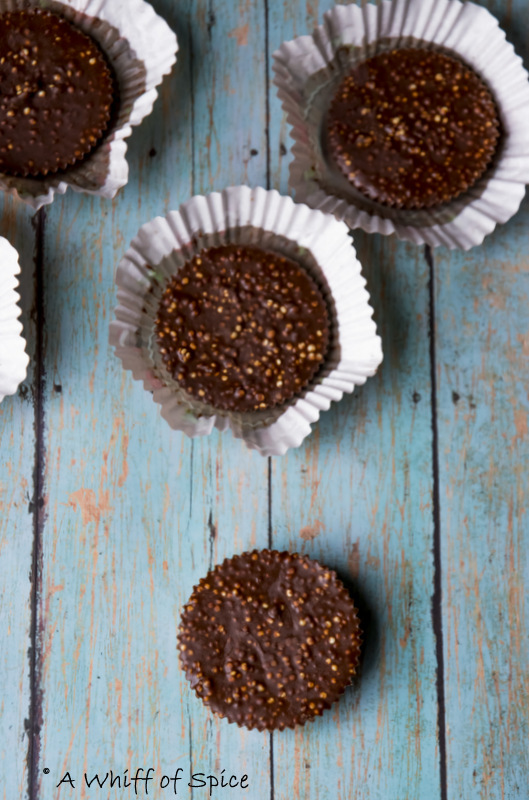 Using a tablespoon measure, fill each muffin cup with 1 heaped tablespoon of the Quinoa-Chocolate-Peanut Butter mixture. Tap the tin lightly for the mix to spread and settle down. Freeze the muffin tin for an hour for the cups to set. 7. Peel of the liner and enjoy. Store the leftovers in an airtight container or a Ziploc baggie in the refrigerator. Notes/Tip: Any other nut butter can be substituted for Peanut Butter in this recipe.